Property For Sale Friend selling his great 13.5 acre + house just across the road! LOOK! 7582 FM205 Wake up. Get on bike. Ride! A note on camping -- We do not allow camping. The camping area is closed year-round. Especially during wet weather, check the tweets just on the left side of this page for trail conditions, closings, or other news. Some of you know how to get Twitter to feed to your phone so you can get updates automatically. Believers on Mountain Bikes is a monthly thing. Plans are to meet on Saturday once a month. There's some group discussion and fellowship for 20-25 minutes, and riding after. 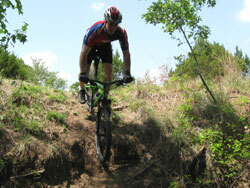 Search FaceBook for Believers on Mountain Bikes (North Texas). Fee is waived for all attendees but please complete the Liability Waiver in the Sign-In area. In the Welcome shed, you sign-in, pay the fee of $3/person, and slip into the changing booth if needed. Tables and chairs are also here for your use. A reminder - The trail is what we are sharing. Stay on it please. 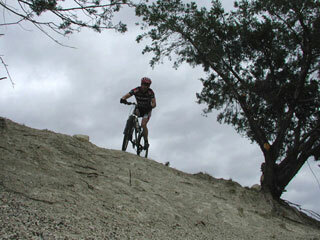 Ride it responsibly, respecting that we have the trail built the way we like it - NEVER alter the trail. Never ride muddy trails. If you are riding here that means that you are a Friend. Help me protect the priviledge for you and others by speaking out if you see some bad behavior. Take your trash with you. Leave the "Friends" area clean for the next guy! Before you come, please read the rules. Trail Tips Guests are asked to help us stay clean and safe; report any problems. 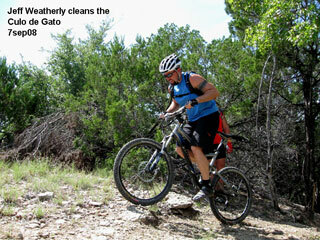 This Texas mountain bike trail is located in the limestone hills of the Paluxy River watershed. Just down the road is the Dinosaur Valley State Park. 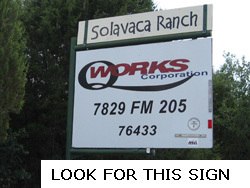 Solavaca is a privately owned ranch with an ideal topography for a mountain bike trail. 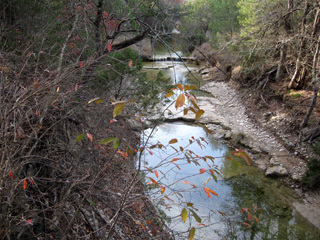 A seasonal creek runs across the property from south to north. 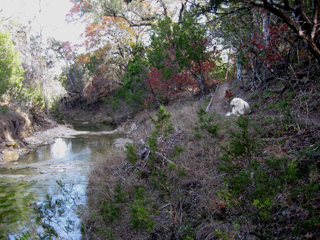 This clear water creek, flowing or dry, is dominate in several of the more technical parts of the trail. The 8+ miles of single-track trail - all marked ORANGE - lead the rider through a variety of challenges as well as sections of scenic and fast riding. 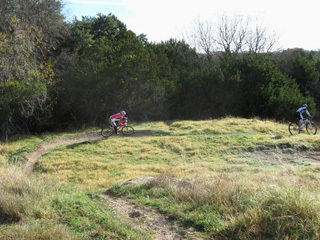 The Hargrave's designed, built, and maintain the trail. Some sections require a more advanced level of skill and a bike that is built to handle it. 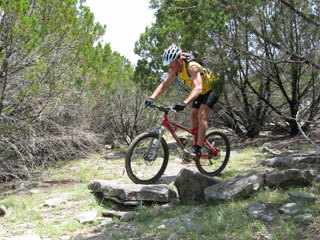 Rocky descents, climbing, steep dropoffs, roots, logs, a rock garden, just to name a few. Beginners may want to use the "go-arounds" marked with WHITE arrows, so as to avoid the more technical sections. But for some, the harder sections should be walked just to be safe. 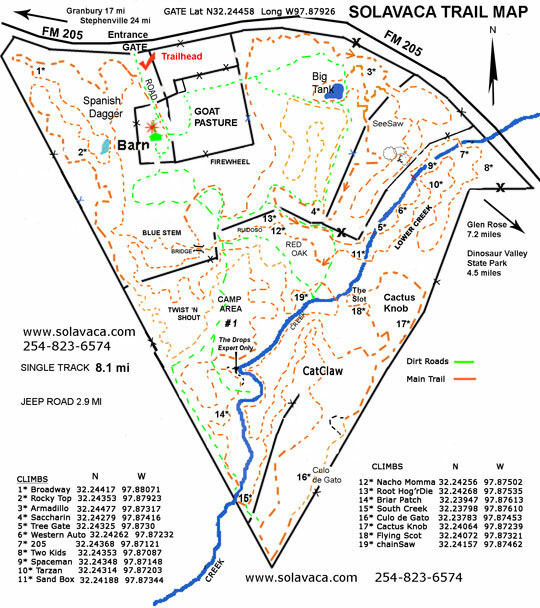 Please keep in mind that the Solavaca is not just a trail but also is the home and private residence of the Hargrave's. Please respect the delicate balance between our hospitality and our privacy. Stay in the areas alloted for your use. The barn and the immediate proximity is private. Read the rules of use and adhere to those strictly (see the Use and Camping link above). Complete the waiver completely as soon as you arrive. Wear a helmet whenever you are on a bicycle, properly fit and properly worn. We share the trail for a nominal fee. We are not, and do not want to be treated as, a public venue. Helmets are required when you are astride a bike please. When you drive up to the gate, it will be closed to keep the livestock in. The dogs that guard the goats will bark but they will not bother you. Come in and please close the gate behind you. You will see the Sign-In/Visitor area where you will go to sign the waiver. Drop your FEE ($3 per person) in the can provided. There are tables, chairs, shade, and a porta-jon provided nearby. The trail is just feet from the Visitor area - immediately across the driveway. Follow the ORANGE markers, or take the WHITE arrows to shorten the loop a little. All trail leads back to the trail-head eventually. ORANGE Loop mileage is 8.5 miles. The ranch roads are not generally for biking but serve to get you back if you have an emergency or a mechanical. Please try to avoid cutting through the Hargrave's house/barn area except in the case of an emergency. Open every day of the week. Closures for any reason will be announced in the "Trail Status Updates" near the top/left of this page (Twitter Feed). How you do the Cola de Gato? Take off your shirt! Welcome to my place. It is a nice place to kick back and soak in the good country. 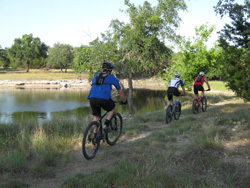 Or you could jump on your mountain bike and pump up, down, around and through the rock strewn hills and cedar covered reaches of the Solavaca - a Texas Mountain Bike Trail. 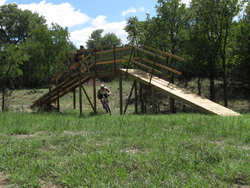 The Solavaca is very diverse with enough trail to interest beginners as well as seasoned riders looking for techincal riding and single-track in the XC tradition. 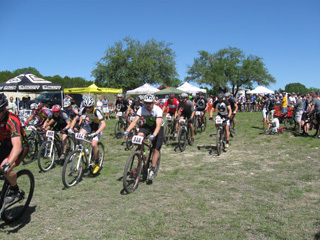 In 2008, we hosted our first mountain bike race. From 2010-13, we were a regular stop for the TMBRA XC Spring State Championship Series. In 2013 we also hosted Bryan Fawley's Fossil 50. Who knows what events we might do? Special thanks to Larry Colvin, long-time President of the FWMBA. I met Larry in October, 2007. He took the time to hear about the trail and then to come ride it. 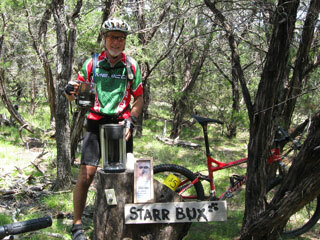 Larry rode the trail twice in the next few months, offering suggestions both on the trail and on the mountain bike scene. Just watching him ride put things in another perspective. He continues to be a great advocate and a steady source of support on many levels. 254.823.6574 or cell 214-773-4614. You are welcome to drop in. Official length of the ORANGE trail is 8.5 miles. There is one main trail. It is ORANGE. At a few places there are options but all choices will return to the ORANGE trail. White arrows indicate go-arounds so that some of the technical obstacles can be bypassed. Please note that not all technical areas have a bypass. Sign-in and complete a Waiver at the Sign-In area near the front gate.. Every visitor must sign in and complete a waiver with all information requested. No exceptions. Parents please list and sign for your children (under the age of 18)in the area provided on your Waiver. The Sign-In Area will be in view at 4.8 miles, 6.7 miles. Reference times for the 8.5 miles are from Pro-fast 40 minutes, to casual/beginner 1 hour 40 minutes.